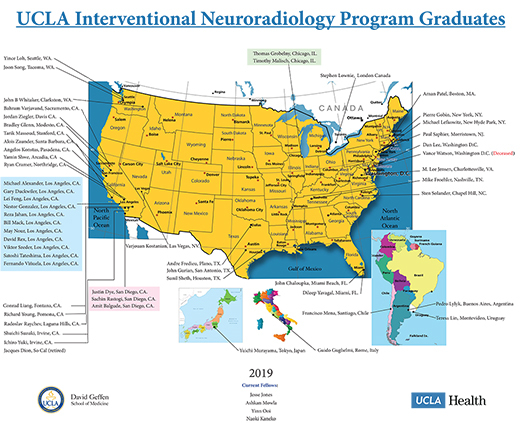 The UCLA Division of Interventional Neuroradiology accepts fellows from Radiology, Neurology and Neurosurgery backgrounds. We do accept individuals who have completed some of the preparatory years at other institutions at the discretion of the Faculty. However, in no case will the training be less than one year of Neurointervention, and is more typically two years. After completion of Radiology Residency and a Diagnostic Neuroradiology Fellowship, two years of ESN/INR are necessary. The Diagnostic Neuroradiology fellowship can be done at UCLA or elsewhere. The application for the UCLA Diagnostic Neuroradiology Fellowship is separate from the INR application. If accepted for an interview, they can be done in the same visit (but expect to stay for two days). After completion of Neurology residency and a Stroke Neurology or Neurocritical Care Fellowship then the training is two years of ESN/INR. The Stroke and Vascular Neurology or Neurocritical Care Fellowship can be done at UCLA or elsewhere. 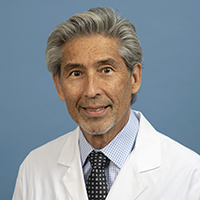 The UCLA Stroke and Vascular Neurology and Neurocritical Care Fellowships require a separate application (http://www.neurology.ucla.edu). Applicants accepted for interviews by both the Neurology Fellowships and INR/ESN Fellowship can arrange to meet with both programs at the same session, schedule permitting. If so, expect to spend two days for the interview process. After completion of Neurosurgery residency, the program is two years. Since we do interview for positions up to three years before the start of the actual Neurointerventional year, applicants are encouraged to apply early if their intention is to receive preliminary training elsewhere (Neurologists and Radiologist), or if coming from a Neurosurgical program. Please note, the Interventional Neuroradiology fellowship is not an ACGME accredited program, so the UCLA GME office will only allow us to train US Citizens or Green Card Holders.